Eva stood on the main pier of the Royal Yacht Squadron, her arm linked with Hetta’s. The launch would be back for the rest of the guests, but she and Hetta and a few other servants might not make it on until a third crossing. Nor had they been invited to wait inside the building after the ceremony. Thank goodness both women had worn their sturdy woolen coats and close-fitting hats. Footsteps echoed on the boards behind her, and Eva glanced over her shoulder. What she saw made her slide her arm free of Hetta’s and turn full around. “It’s all right. I was surprised, too. I suppose the countess invited me to impress upon me the fact that Lady Julia is taken now.” He nodded to Hetta, who offered a shy smile and nodded back, though Eva caught the faintest hint of pity in her bright azure eyes. Hetta had not known him before the war, but its ravages were plain to see. His lordship had once been a handsome man—before the mustard gases of the Battle of the Somme. From the corner of his mouth to the left side of his chin and beneath, the chemical burns had left the skin pitted and stretched, a permanent sneer whether he willed or not. And his hands . . . It pained Eva to see him struggle to perform the simplest tasks, yet perform them he did, without assistance, with minimal fuss. His last words sank in and took her aback. There had never been open acknowledgment of his affections for Lady Julia—at least not in Eva’s hearing. The intimacy of his admission, so at odds with their disparate stations, sent a heat of confusion to her cheeks. And yet he had ventured onto the dock to speak with her. She owed him her attention, and any solace she could offer. Her heart dropped. Of course he would ask this—the one question she felt incapable of answering truthfully. She prided herself on her honesty; speaking lies was abhorrent to her. She narrowed her eyes in the glare cast by the steely waters and studied the Marquess of Allerton. What did he seek? An assurance of Julia’s happiness, or the knowledge that she had sacrificed her true desires for the good of the family? Which would put his mind more at ease, knowing she loved him still or believing her heart had switched its allegiance? Desperation flitted at the corners of his eyes. His hands were balled in the pockets of his overcoat. He loved her; Eva believed that fully. And she realized, given the totality of the circumstances, what she must say. Eva’s throat clogged, and she couldn’t trust her voice not to betray her. She forced a smile, a small one, which the marquess returned briefly. Then he thanked her, bade her and Hetta good day, and made his way back to the clubhouse. Moments later, a motorcar pulled away from the building—a gleaming Silver Ghost that had once belonged to Theo Leighton’s deceased brother, who had been the Marquess of Allerton before him. 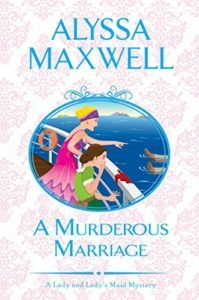 He would make his way to the ferry landing and leave Cowes—and Lady Julia— behind him. Eva turned away from the retreating motorcar. “Everything is fine,” she lied, because she could not have made Hetta understand, not with the language barrier between them. But she hadn’t exactly lied to the marquess. She hadn’t said, as he believed, that Lady Julia was happy. She had said she believed Lady Julia would be happy. Someday. Eva clung to the notion. But whether that happiness would someday include Theo Leighton, who could say? The launch, having deposited its first round of passengers onto the decks of the Georgiana, had turned around and was once more approaching the pier. The doors of the clubhouse opened, and wedding guests began filing out. Judging by the number of them, Eva and Hetta would be waiting for a third crossing. She drew Hetta off to the side so they wouldn’t be in the way. Love reading mysteries, Thanks for your generosity. 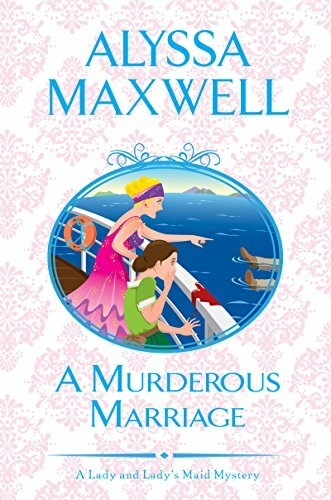 Thank you for being part of the book tour for “A Murderous Marriage by Alyssa Maxwell and for introducing me to a new to me author.